Bubble Witch Saga is a Puzzle Bobble style puzzle game from King.com. In Bubble Witch Saga, the player guides three witches on a quest to restore peace to a kingdom. During the game, the player aims colored bubbles fired from a cauldron, which attach to existing bubbles on the screen. When a bubble attaches itself to two or more bubbles of the same color, they pop, and cause any bubbles that were attached to the popped bubbles to fall down from the stage. 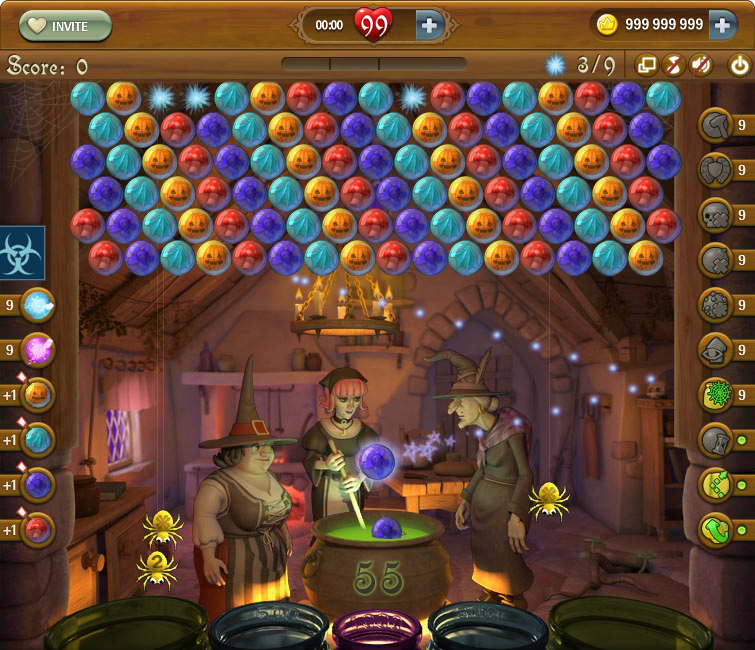 At the bottom of the screen, five cauldrons are situated, where fallen bubbles fall down. The game awards points for each dislodged bubble falling in a cauldron (more points for smaller cauldrons). The level selection screen is displayed as a map of the kingdom, and is divided into several areas. To proceed to the next area, the player must clear all levels in the previous area, and fulfill an additional requirement, such as getting a number of other players to help them complete a task. Depending on the number of points collected during a level, the game awards up to three stars per level. Collecting certain amounts of stars unlocks powerups the player can purchase, using in-game money. These powerups offer passive or user-activated abilities during gameplay. Bubble Witch Saga is a clone of Puzzle Bobble, the original bubble puzzle game from Taito Corporation. The potions and charms will only be remembered for the playing session. You will need to “buy” or enable them every time you play the game. The potions do not deplete by themselves. To choose other potions or charms, reload the game. It’s not possible to directly cheat unlocking new episodes. You’ll have to bug your friends or support the game developers to unlock levels. 2012.05.05 - Fixed being unable to purchase level unlock. HI you know that you can not do update Windus 8? Someone manages to play the game? ok now no longer working for me. anyone else? thank you for letting me know that i'm not the only one! An update for this cheat has been released. Install the latest extension version to obtain it.